Set in the fictional Hope County, Far Cry 5 has left the Mesolithic period seen in last game and returned to modern times. Judging from the title's first artwork, it could feature another sinister yet charismatic villain in the same vein as previous Far Cry antagonists Pagan Min and Vaas Montenegro. 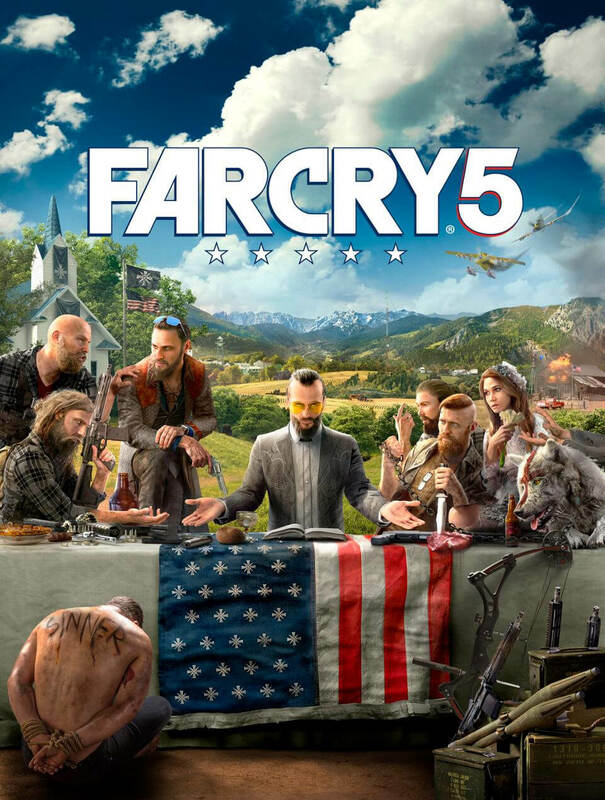 The Last Supper-style picture also suggests that Far Cry 5 could garner some controversy. There’s a strong suggestion that as the hero of the game, you’ll be facing some kind of religious militia group. The central, Christ-like figure sitting at the center of the table is surrounded by plenty of automatic weapon-toting, dog tag-wearing, survivalist types, though the woman with flowers in her hair is an exception (as is the painted wolf). More hints at the religious element of the group include the bound man on the floor with the words “sinner” wrote, or carved, into his back. There’s also a goblet of wine, a piece of bread, and what could be a bible on the table, while a church stands in the background. You might notice the Nazi-style Iron Cross that replaces the stars on the American flag draped over the table. A flag bearing the same symbol flies above the stars (crosses?) and stripes next to the church. There’s also a couple of planes flying in the background – suggesting the game will feature them as playable vehicles, expanding on previous entries’ gyrocopters, wingsuits, and hang gliders. As much as I loved all the previous Far Cry titles, I wasn’t enamored with Far Cry Primal, and am glad to see the series return to guns, vehicles, and psychopathic yet charming bad guys. It’ll be interesting to see how much criticism the game takes from those with certain political viewpoints, but it’s something Ubisoft will doubtlessly be expecting. We’ll learn more about Far Cry 5 at E3 next month.